My third giveaway is a piece a jewelry I made during the time I was writing one of the projects I have in the book Metal Clay in Color. 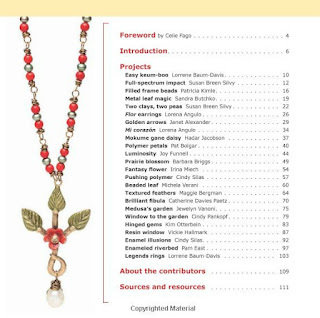 You can see this necklace in the book too. 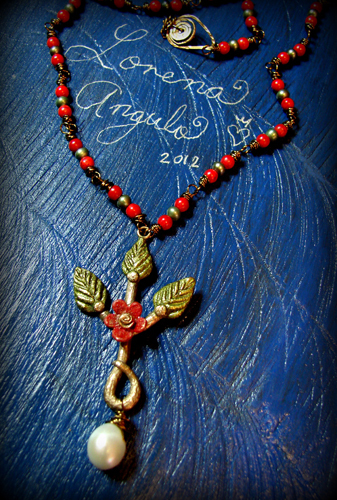 I made this necklace using bronze clay, bronze wire, pearls, red coral and added color to the bronze piece with Gilders paste. If you want to have a chance to win this necklace, please write me a message here in my blog post. I will announce the winner next week on Monday. The winner of my second giveaway was KENJI, hope he likes my postcards !! LOVE this necklace! that's not surprising, as i love pretty much everything you create! LOVE this necklace - the bronze with red, the flower - all of it! Love this Lorena! It's really beautiful!!! I find your work so inspirational! Que hermoso Lorena! Lindo trabajo como siempre. Such a beautiful design, yet so simple. Reminds me of the Tree of Life. Every piece you make shows such thought behind it. So utterly beautiful! The colors are so vibrant and the combination is a winner. I love the way you play with the gilders paste. What more can I say excepth that I would be honored to win such a prize. Just lovely and gorgeous! Would love to win this to give to my very best friend in the world, Yvonne! (Mi amiga mejor?) Whoever wins this treasure will be very lucky indeed! ¡Qué maravilloso! The pendant looks just plucked from the tree of life. 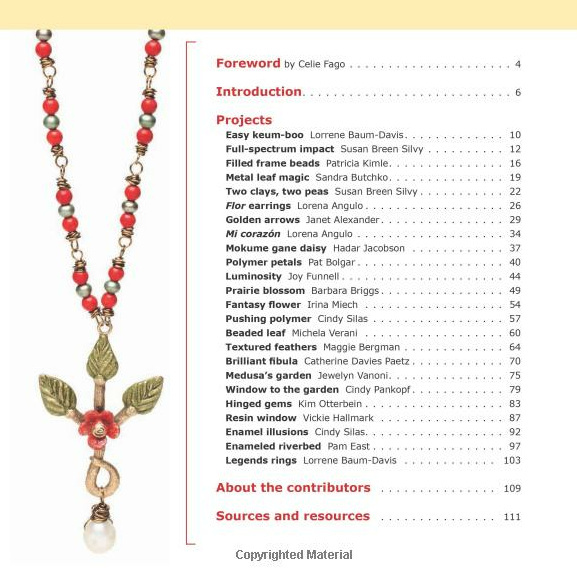 I love the pearl with the bronze and red beads of the chain. What an incredible piece to send out into the world. I can't wait to get my hands on your book. Mil gracias por un giveaway fantástico. What a beautiful necklace. It would be an honor to win and wear this wonderful piece of art! This piece of jewelry is so beautiful and very unique. It looks like a religious piece that tells a story. It resembles a beautiful rosary; the three leaves could be the father, son and holy spirit. The delicate pearl a symbol of purity and innocence, the flower representing beauty and the curl on the stem could represent one of the thorns on Jesus crown of thorns. Such a precious piece. I am curious now and will look for your book, Metal Clay in Color. Lorena, your work continues to amaze and inspire so many. You are truely a gift to the world. Today I found a shiny copper penny! Maybe this will being me the good luck of winning this draw! I love your work. It's amazing and inspiring. I'll keep my fingers crossed! I love your work, it's so inspiring!! Incredible work. Inspiring work. I would be honored to wear such a beautiful piece of art created by you. Thank you for the opportunity Lorena. Lorena, este collar como todas tus piezas, ¡es hermoso! Me encanta mucho el árbol de la vida con esa pequeña flor. love the necklace. so pretty! Brings me back to when I lived in Tucson in the late 70's. It was lovely, less congested and natural then. Much like this necklace. It essence ring clear. Bright. and Stongly. It is not for the timid.